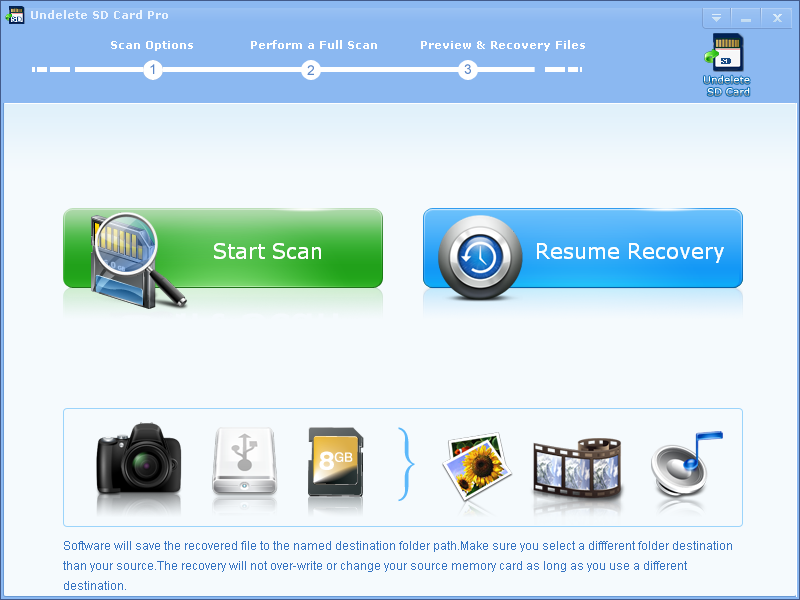 Undelete SD Card Recovery Pro recovers lost or deleted files in 3 Steps. 100% risk free! Support all camera memory cards such as SD card, CF Card, Etc. Support all camera brands and almost all raw file formats. Undelete SD Card Recovery Pro is a FREE, fast and safe solution for your lost data recovery from SD card. This free SD card recovery software provides easy and quick data recovery solutions to recover lost files from a SD card. It supports all brands including SanDisk, Kingston, PNY, Lexar, Transcent, PQI and more. Generally, if the lost data on the SD card is not damaged or overwritten, Undelete SD Card Recovery Pro will help you to recover it and get all your precious photos back. Undelete SD Card Recovery Pro can retrieve not only SD card but also other memory cards such as Compact Flash card, CF Type I, Type II, MicroDrive, CF card, Memory Stick, Memory Stick Pro, Duo, Pro-HG, XC, Micro (M2), MultiMedia card, MMC card, SmartMedia, flash card, xD Picture card, ect. As Undelete SD Card Recovery Pro has several years history on recovering and retrieving SD card, many people rely on it very much and it is and will be their first and best choice. Some people recommend this magic SD card recovery software to the people around them. As it can efficiently and effectively recover lost, deleted, corrupted or formatted photos and video files from various SD cards. Undelete SD Card Recovery Pro can undelete all daily files, data, but also images, pictures, music, audios and videos with almost all kinds of formats: PNG, TIFF, INDD, JP2, PSD, Paint Shop Pro Image File (PSP) for picture; M4P, RPS, AIFF, MIDI, M4A, AU, OGG, WMA, RM, Real Audio (RA) for audios; DV, M4V, 3G2, M4B, AVCHD Video File (MTS), Divx Encoded Movie File (DIVX), Matroska Video File (MKV), MOI Video File, OGG Media Player (OGM), Video Object File (VOB), 3G2, ASX for videos. One of the advantages is Undelete SD Card Recovery Pro can support Preview Recovery which means you can display of recoverable photos or files as thumbnails and Batch Recovery which means recover multi files at one time. 2013-04-08 2.9.1 New feature preivew thumbnails of picture.